After the great success of Ode to peace in 2018, The Lights of the Cathedral presents The Song of Stars. The voices and the lights will float in the air like the stars in the celestial vault. 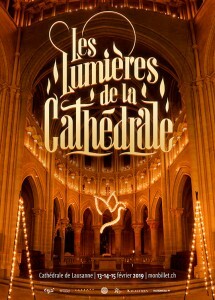 A unique experience of enlightenment and musical setting of the cathedral of Lausanne. With an exceptional choir of more than 50 singers created only for this occasion! The concert begins at the indicated time, for motivated people I propose to meet at 07.45 PM in The Great Escape (http://www.the-great.ch/home.php) to have a quick drink before the event, for others appointment directly in our places.